Thank you Rich, I will do all of this too. It would be good if it is not the switch. Yes, it could be the stalk/dip switch. But first check Fuse 15, high beam (Main Beam) relay. Pull it, inspect it, clean the contacts. Replace or swap in a known good one if in doubt. Short version: The high beam fuse and the high beam relay, driven by the stalk switch, run all 4 headlights. Normally when the switch is moved to high beam position it turns OFF the low beam filament in the low beam lamps (turns off low beam relay) and it turns ON the high beam filament in the low beam lamps AND the high beams (only one filament in the high beams). Also turns on the blue HB indicator on the dash. So if all 4 lamps (and the high beam indicator) are off when switch is in HI position then the high beam circuit (which drives all 4 headlamps) is off when it should be on. That can happen if you have a bad dip switch, bad connector at dip switch, bad high beam fuse/socket or bad high beam relay, in order of circuit position. You know the relay is OK. Next easiest check is the High Beam fuse. It is between the switch and the HB relay. If the fuse checks out then you can probe for +12V at the fuse socket to see if the switch and i the switch connector are delivering voltage to it. He is suggesting to replace the bulbs in the switches with leds not the actual headlights. Hopefully this picture is clear. I wonder if this wire not being attached is the source of the problem of not having any High Beam?? Any thoughts. Its possible? Do you have the wiring schematic? Will try and figure out from the diagram, electrics are not my strong point. Thank you. The schematic that DMC sells is full poster size and in full color! It was very helpful when I redid 11035! That purple wire looks like a power wire going to the buzzer module. Don't let that ground out. Do your high beams work if you pull the stalk towards you? In any case, check power to high beam relay, and swap low and high to test if it is a bad relay. 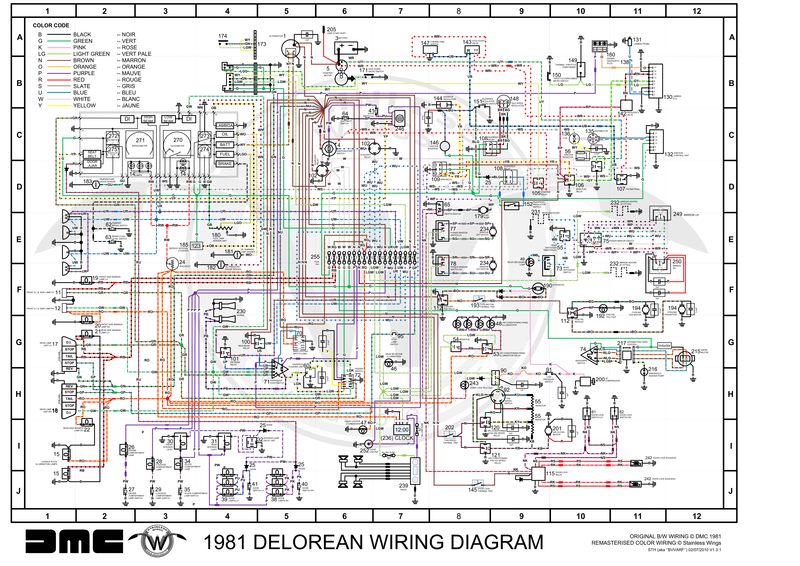 You can also find a PDF or jpg copy of the delorean wiring diagrams on DMCtalk. Just look it up on Google. Last edited by 81dmc; 10-26-2018 at 07:00 PM. Thank you. When I push the lever away from me all the front lights go out. If I push it forward the same happens. The warning lamp on the display does not illuminate either. Park and single beam work fine but go out when the stalk is used. I will take another look at all the suggestions and continue to work on it.